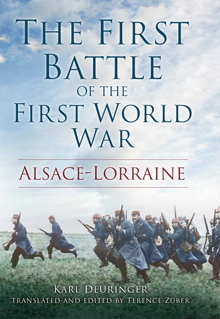 The first major battle of the Great War was fought in Alsace-Lorraine on 20 August 1914, a week before the Battle of Tannenberg in East Prussia and over two weeks before the Battle of the Marne. After 43 years of peace, this was the first test of strength between French and German armies. The German account of the battle was described in 1929 by Karl Deuringer in his massive 890-page study The Battle of Lorraine, the most highly-detailed description of tactical combat in August and September 1914, indeed probably the best tactical history of the entire war. First Battle 1914 presents a condensed translation of Deuringer’s brilliant book, with numerous excellent maps, and the only detailed description of in English of the Battle of Alsace-Lorraine, and officially authorized by the Bavarian Army Archive.